Flowers are in loose panicles 5/8 to 2 in. long. Maple Springs Rd., Cleveland National Forest, Orange Co., CA. 3-24-12. © Joan Avise. 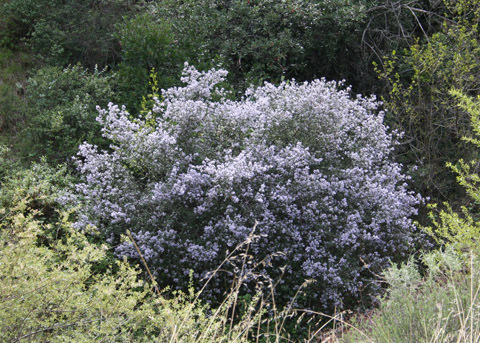 An erect evergreen shrub, sometimes tree-like, up to 9 ft. tall with flexible, hairy young branches and twigs; occasional in chaparral in the Santa Ana Mountains. 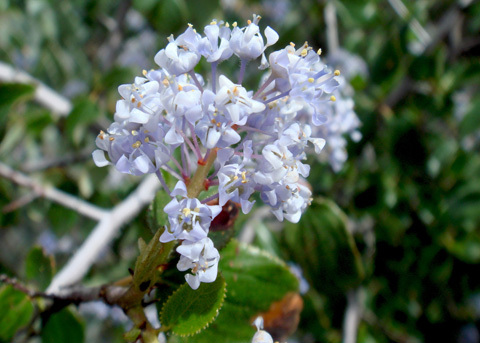 "Often confused with and probably hybridizes with Ceanothus tomentosus." 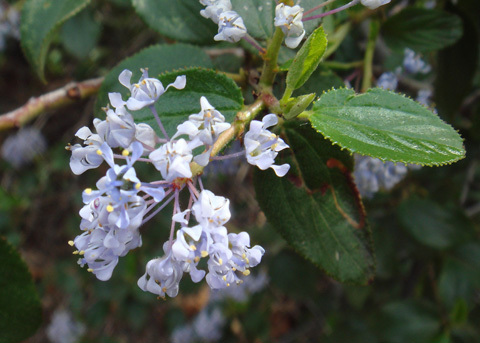 "The separation between these species in Orange County is often weak and many individuals identified as S. tomentosus or C. olioganthus may be hybrids." (Roberts, p. 187). 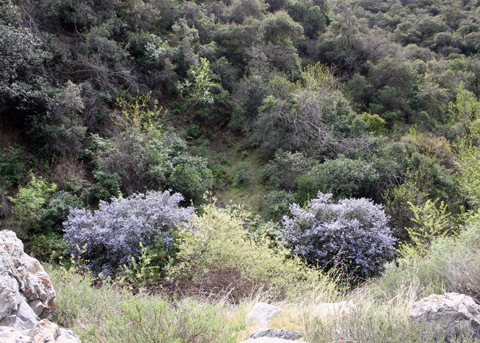 Two variants occur in Orange County, C. oliganthus var. oliganthus and C. o. var. sorediatus (Jim Brush), differentiated by the leaves and twigs: var. 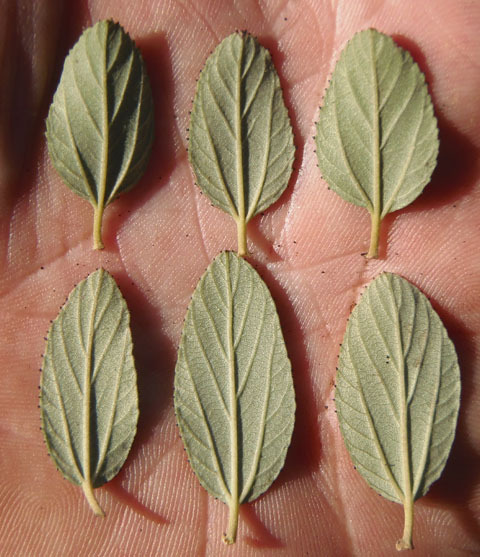 oliganthus with alternate 1 1/2 in. leaves, short-hairy on both sides, and green to red-brown hairy twigs; var. 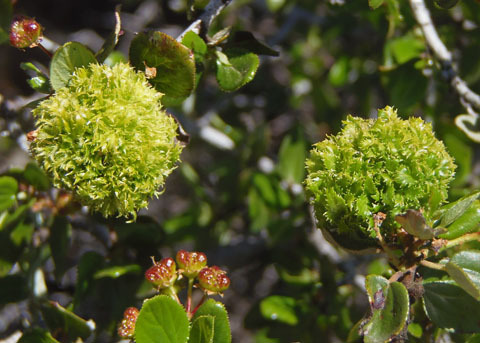 sorediatus with smooth or sparsely hairy leaves above, downy below, and twigs that are generally grayish green (but some can also be red-brown) and often not hairy. Scale-like stipules drop early. Flowering: C. o. oliganthus- December to June; C. o. sorediatus- January to May (JM2). 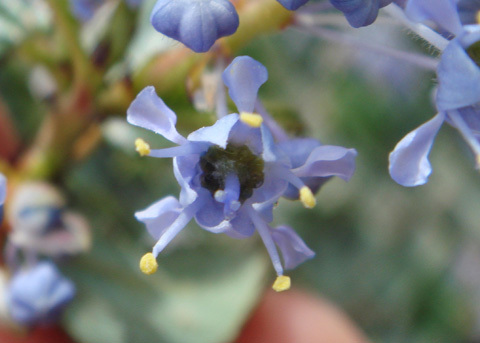 Flowers have five pale to deep blue, hood-like petals and five persistent, incurved, sepals, the latter attached to a smooth disk below the base of the ovary. 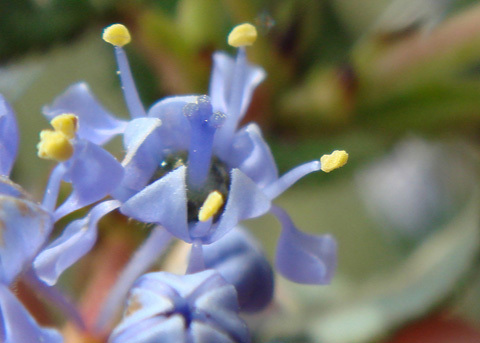 The five stamens with bright yellow anthers are in between the sepals. The half-inferior 3-lobed ovary with three styles produces a sticky, generally smooth, 5 mm. capsular fruit with three rounded apical segments and no horns. Maple Springs Rd., Cleveland National Forest, Orange Co., CA. 3-24-12. © Joan Avise. The leaf margins of both varieties have 20-70 teeth, three prominent veins from the leaf base, and both are dark green above, paler below. The marginal teeth bear spherical glands. Maple Springs Rd., Cleveland National Forest, Orange Co., CA. 3-24-12. © Joan Avise. Maple Springs Rd., Cleveland National Forest, Orange Co., CA. 3-24-12. © Joan Avise. Leaf underside paler, downy, especially around the veins. Maple Springs Rd., Cleveland National Forest, Orange Co., CA. 3-24-12. © Joan Avise. Maple Springs Rd., Cleveland National Forest, Orange Co., CA.3-24-12. © Joan Avise. var. oliganthus. Bluewater Trail, fr Oak Flats to San Mateo Cyn., 2-8-15. © Ron Vanderhoff. 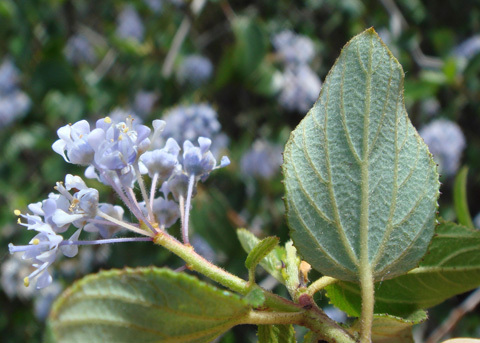 Galls on Ceanothus oliganthus var. 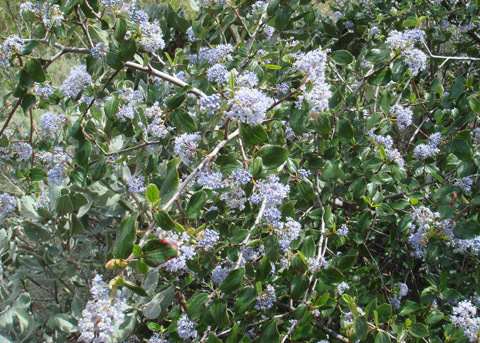 oliganthus, Los Pinos Trail, Upper Trabuco, etc. 4-30-15. © Ron Vanderhoff.